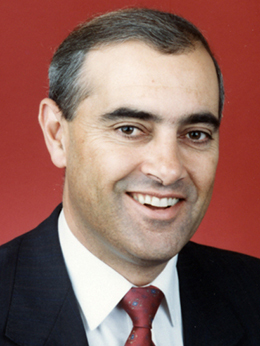 John Wayne Olsen, Liberal Party Premier of South Australia 1996–2001, served two years in the Senate from 7 May 1990, when he filled a casual vacancy caused by the resignation of Senator Tony Messner. A colourful backgrounder in the Australian on 29 November 1996, the day after he became Premier of South Australia, argued that there was a defining moment in Olsen's life when he was eighteen and with his father when the latter suffered a massive heart attack and died while driving the family speedboat. Other defining moments revolved around his fortunes as a state politician; his two years in the Senate rated barely a mention. State politics was clearly the main game for John Olsen. Born in Kadina in rural South Australia on 7 June 1945, Olsen was the son of Stanley John Olsen, owner of an agricultural machine and motor vehicle business, and his wife Joyce Rosalind, née Heath. He was educated at Kadina Memorial High School, studied accountancy at the South Australian School of Business Studies, spent a period from 1962 as a bank clerk with the SA Savings Bank, and by 1968 was managing director of the family business, J. R. Olsen & Sons Pty Ltd. His determination to be part of the political process and influence policy direction was inspired by what he saw as the need to address the neglect of small business interests under Don Dunstan, and 'the excesses of the Dunstan and Whitlam era'. Olsen became politically engaged first as president of South Australia's Rural Youth (1970) and later as a Kadina town councillor from 1971, and mayor of Kadina from 1974 to 1977. He was also South Australian president of the Federation of Chambers of Commerce from 1974 to 1976. In May 1968 he married Julie Abbott; they were to have two sons and a daughter. In 1976 Olsen was elected president of the South Australian division of the Liberal Party, an office which he held until 1979 when he was elected to the South Australian House of Assembly as the member for Rocky River; following a boundary redistribution in 1985 he became the member for Custance. Olsen served as Chief Secretary and Minister for Fisheries in the Tonkin Liberal Government from March 1982 until the ALP victory in the state election in November of that year. David Tonkin resigned from Parliament, and Olsen defeated Dean Brown in a ballot for leadership of the party. As Leader of the Opposition in the South Australian Parliament, he contested and lost the 1985 and 1989 state elections against Labor Premier John Bannon. Following the defeat of November 1989, in which his party obtained more than fifty per cent of the two-party preferred vote, Olsen indicated that he would accept nomination for the Senate vacancy to be caused by the impending resignation of Senator Tony Messner. He resigned as Leader in January 1990, and resigned his seat in the House of Assembly immediately before being chosen for the vacancy by a joint sitting of the Houses of the SA Parliament on 7 May 1990; he was sworn in the Senate on the following day. Olsen's first speech, delivered on 21 May 1990, called for increased unity for a 'fragmented and nervous nation'. He criticised the regulatory duplication that characterised federal and state administration of health, education and housing, and urged the restructuring of the economy through privatisation and the deregulation of financial and labour markets, to create an environment 'where freedom and incentive are the basics'. ... the heart of Australia is being left to die. Its main artery is clogged with the salinity and pollution of the States through which it passes, with my State of South Australia ... condemned by a political inertia to being in effect the sewer of Australia. And he addressed immigration issues, arguing that migrants should be encouraged to settle in places other than the east coast, that they should be obliged to become citizens, and to take English language courses. An experienced parliamentarian, during his brief time in the Senate Olsen made 'articulate and forceful, and, at times, emotional' contributions to debate. He spoke often on the state of the economy, particularly its effect on small business and rural communities, and referring frequently to the situation in his home state. Perhaps his most significant contribution was in relation to the ban on the broadcasting of political advertising proposed by the Hawke Government in its Political Broadcasts and Political Disclosures Bill, introduced in May 1991. The bill was a response to concerns emanating from the 1987 federal election and the 1988 referendums, and which were canvassed by the Joint Standing Committee on Electoral Matters in its report, Who Pays the Piper Calls the Tune. The bill imposed a ban on paid political advertisements in the electronic media (later amended to apply only in election periods) and strengthened the rules under the Electoral Act 1918 relating to the transparency of electoral funding. Olsen was vocal in his opposition to the bill, arguing that it infringed the 'democratic right to freedom of speech'. He chaired a public inquiry into the bill conducted by the Coalition, and he became deputy chairman of the Senate Select Committee on Political Broadcasts and Political Disclosures, formed to inquire into the bill in August 1991. When the Committee's report of November 1991 supported the main features of the bill, Olsen, together with Senator Rod Kemp (Lib, Vic. ), submitted a long dissenting report, claiming that the majority report was not a true reflection of the evidence before the Committee, which included submissions that the bill transgressed rights to freedom of expression from a range of sources, including the Human Rights Commissioner. The bill passed in December 1991, but the High Court of Australia found in September 1992 that there was a freedom of communication in relation to political matters implied in the Constitution and that parts of the Act went beyond a justifiable restriction of that freedom. Senators Brownhill, Knowles and Kemp acknowledged Olsen's leading role in opposing the bill in their responses to his valedictory speech in April 1992. ... [J]ust a week after I was given the No. 1 position on our State ticket by my Party in South Australia in early February, I was approached and asked whether I would consider returning to South Australia with a view to leading the Party in that State again in the mid year. The approach came from Dale Baker, leader of the Liberal Party in the South Australian Parliament, who was struggling to capitalise on the presented opportunity in the face of disunity among the parliamentary party members and a poor public image. The member for Kavel, Roger Goldsworthy, resigned to allow Olsen to stand for his safe Liberal Party seat. Olsen's expectations were dashed when a supporter of Dean Brown, his old rival, also resigned his seat to allow Brown to return to state politics, and both men were elected to the South Australian Parliament in by-elections on 9 May. Brown defeated Olsen in a leadership ballot on 11 May 1992 and became Premier when the Liberal Party won the 1993 state election in a landslide against the government led by Lynn Arnold. Olsen held several ministries in the Brown Government, although his rivalry with Dean Brown continued. In November 1996 Olsen challenged for leadership of the party and succeeded, becoming Premier of South Australia. The Leader of the Labor Party, Mike Rann, later told a Commonwealth parliamentary committee that prior to the challenge Olsen had leaked to the Opposition confidential information damaging to Brown. Olsen stated in the media that Rann was lying, and Rann brought a defamation action against him. In a significant interpretation of the Parliamentary Privileges Act 1987, the South Australian Supreme Court held that subsection 16(3) prevented Olsen from using Rann's statement to the committee as evidence that he had lied, in his own defence. The action was discontinued in December 2001. Olsen resigned as Premier in October 2001 following a finding by a government inquiry that that he had given 'misleading, inaccurate and dishonest' evidence to an earlier inquiry into his negotiations with the electronics company Motorola while he was Industry Minister in 1994. Olsen did not stand in the state election of February 2002. Australian (Syd. ), 29 Nov. 1996, p. 13; CPD, 21 May 1990, p. 649; Michael McGuire, 'Not fade away', Advertiser (Adel. ), (SA Weekend), 3 April 2009, pp. 14–17; Dean Jaensch 'The Liberal Party' in Andrew Parkin and Allan Patience, The Bannon Decade, Allen & Unwin, St Leonards, NSW, 1992, pp. 50–58; CT, 8 Dec. 1985, p.1, 26 Nov. 1989, p. 1, 29 Dec. 1989, p. 5. CPD, 21 May 1990, pp. 648–52. CPD (R), 9 May 1991, pp. 3477–83; Joint Standing Committee on Electoral Matters, Who Pays the Piper Calls the Tune, Canberra, June 1989; CPD, 13 Aug. 1991, pp. 60–4, 115–8, 28 Nov. 1991, pp. 3539–40; Senate Select Committee on Political Broadcasts and Political Disclosures, Report, Canberra, 1991; Australian Capital Television Pty Ltd v Commonwealth 1992, HCA 45, 177 CLR 106; CT, 1 Oct. 1992, pp. 1–2; CPD, 29 April 1992, pp. 1836–8. CPD, 19 Sept. 1990, pp. 2611–3, 16 Oct. 1990, pp. 3142–5, 10 Dec. 1991, pp. 4468–72, 5 March 1992, pp. 841–2; CT, 30 Jan. 1992, p. 4. CPD, 29 April 1992, pp. 1826–34; CT, 14 March 1992, p. 2; The Bulletin (Syd. ), 31 March 1992, p. 23. CT, 12 May 1992, p. 2; Rann v. Olsen  SASC 83; House of Representatives Practice, 5th ed., pp. 715–7; Transcript, ABC Radio, 'PM', 19 Oct. 2001; Michael McGuire, 'Not fade away', 2009; Crikey.com, 21 Oct. 2001. This biography was first published in The Biographical Dictionary of the Australian Senate, Vol. 4, 1983-2002, Department of the Senate, Canberra, 2017, pp. 303-306.